I've been having a busy week. 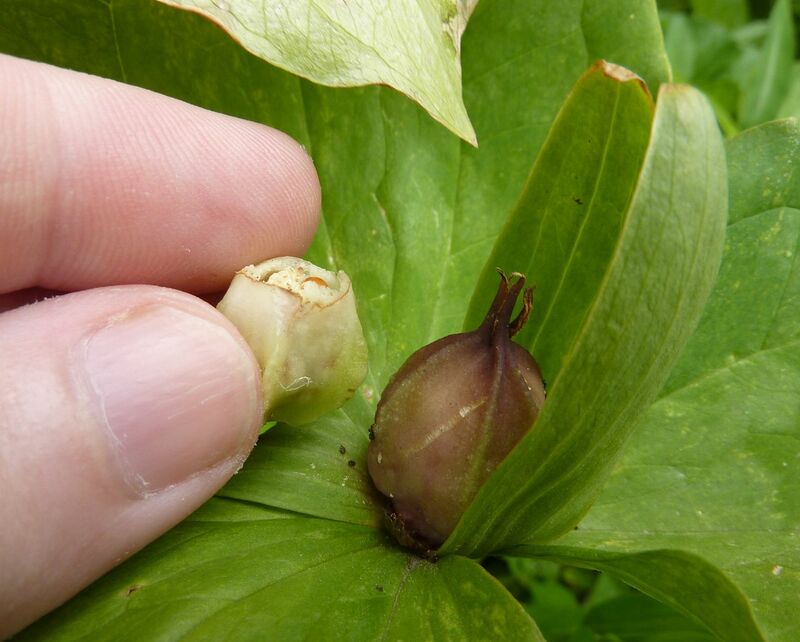 Issues at work, Harvesting Honey, and it figures the Trillium cuneatum berry decided to open. I want to turn the harvesting honey bit into a show so I'll save that for later. Work issues are of course Work and according to the employee manual "I do not legally represent the company," and it's not related anyhow. So that leaves the Trillium thing. 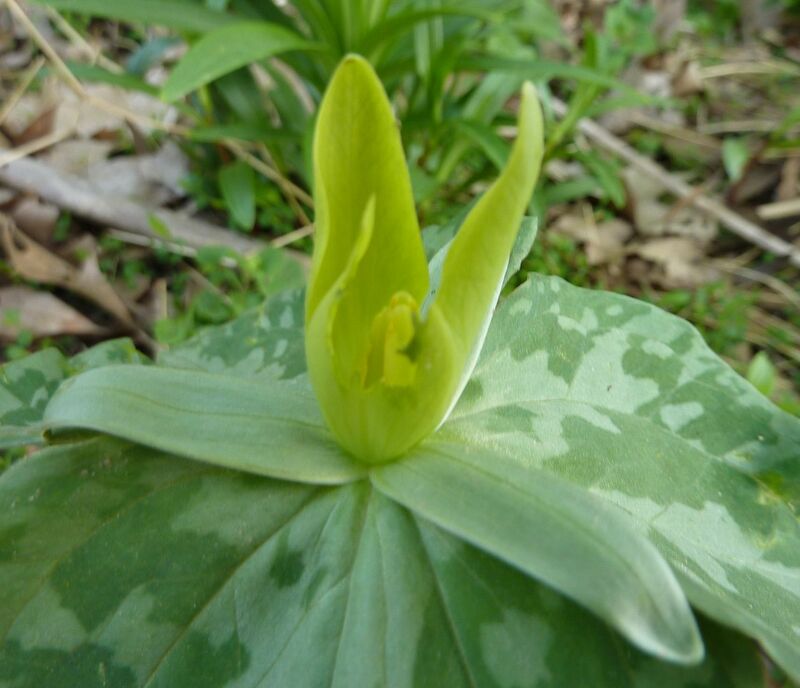 Going back to an earlier photo we have Trillium "berries." They're a leathery pod-like structure filled with a fleshy material with elaiosome covered seeds. The berry eventually opens up and is quickly found by ants. 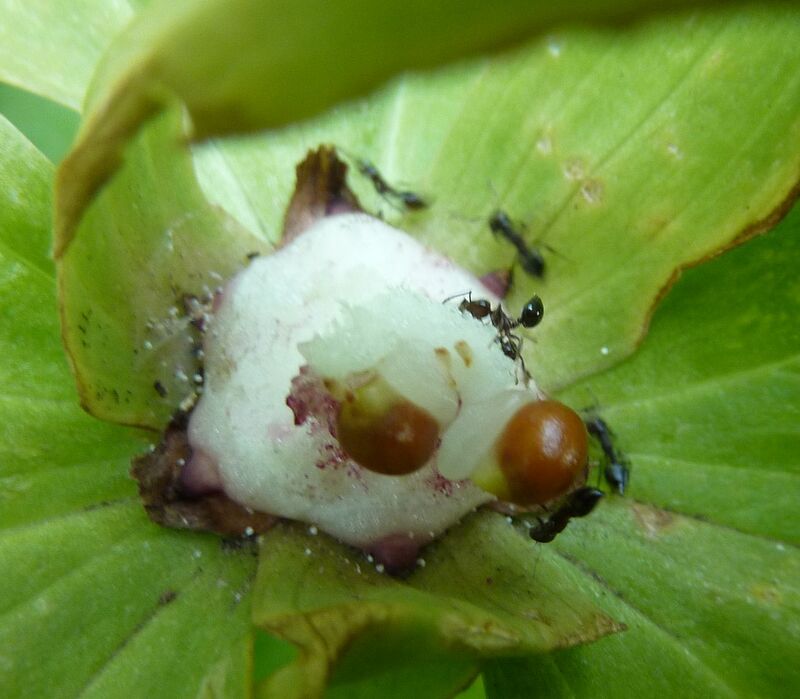 Trilliums rely on ants to disperse their seeds. But not all ants are created equal in doing the job. 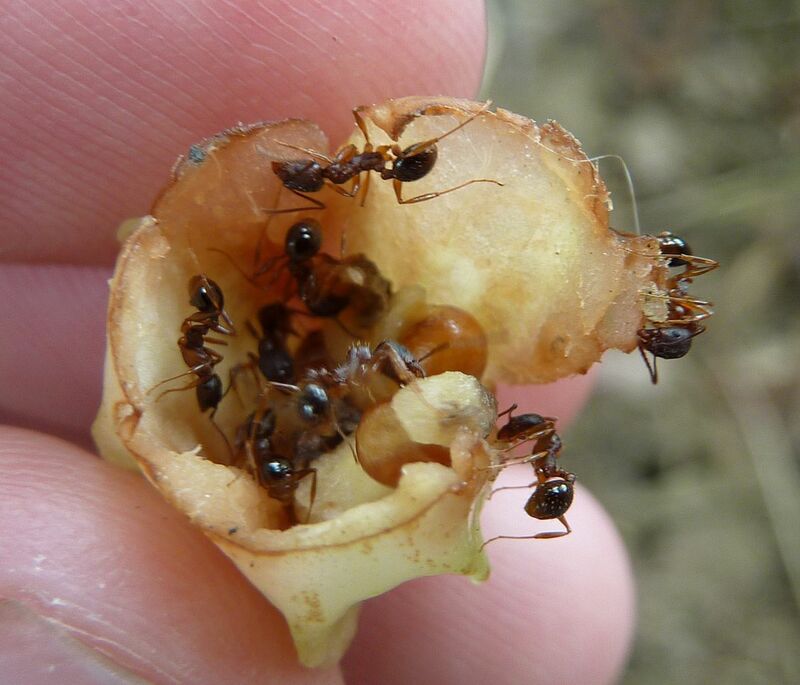 Here we see a Crematogaster species simply foraging inside the seed for the elaiosome and flesh around the seeds, as opposed to taking the seeds back to the nest. Had they dragged these seeds home they would not likely be successful. 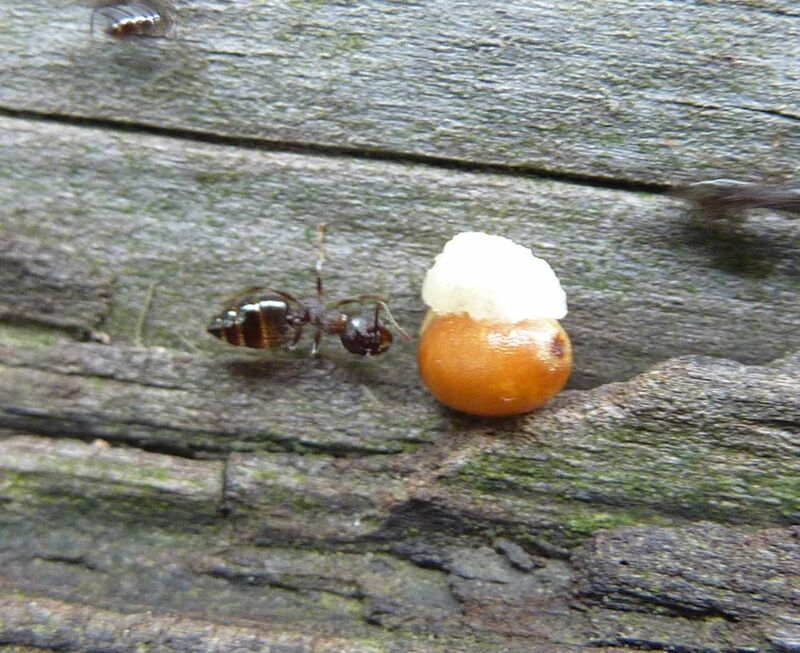 Crematogaster often nest in rotting wood or hallow cavities. 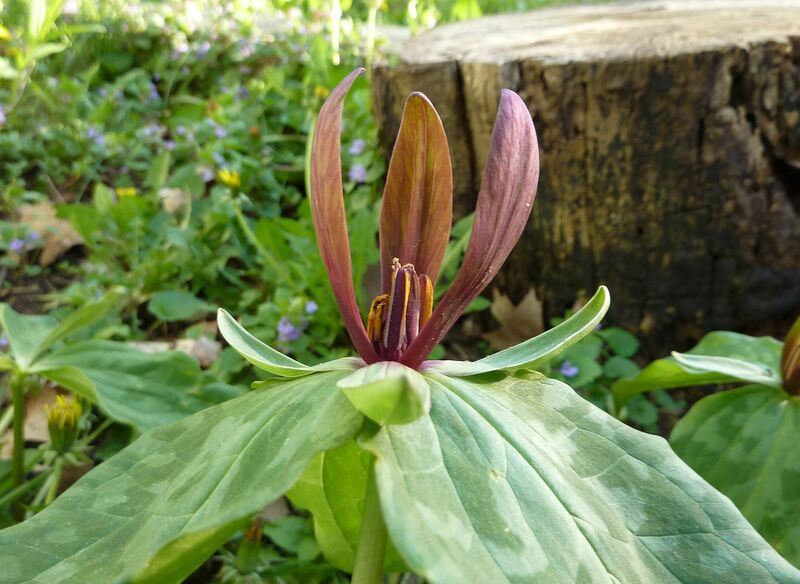 While many Trillium like growing in organic rich soil, sprouting out the sides of a rotting log is not ideal. On the other hand many Crematogaster species are known for their incredibly long foraging lines. This colony in particular runs the full length of our fence, passing through the front drive way, into the front garden, across the front step, into the side garden, and I lose it from there somewhere in the neighbor's yard. I doubt they would even drag the seeds anywhere though. 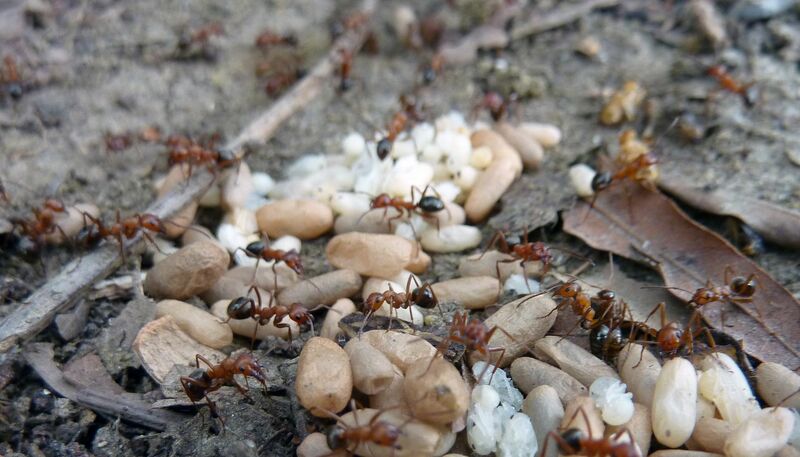 Other ants, typically larger in size, don't have as much of an issue with dragging food to the safety of the nest. Crematogaster get the common name Acrobat Ant for their defensive stance. They are armed with a stinger that dispenses droplets of venom. They use it like a paint brush to lubricate the joints of their foes with it. Even after the berry is gone they still treat the remaining flesh as a food item. Naturally I've done some testing with my seeds. 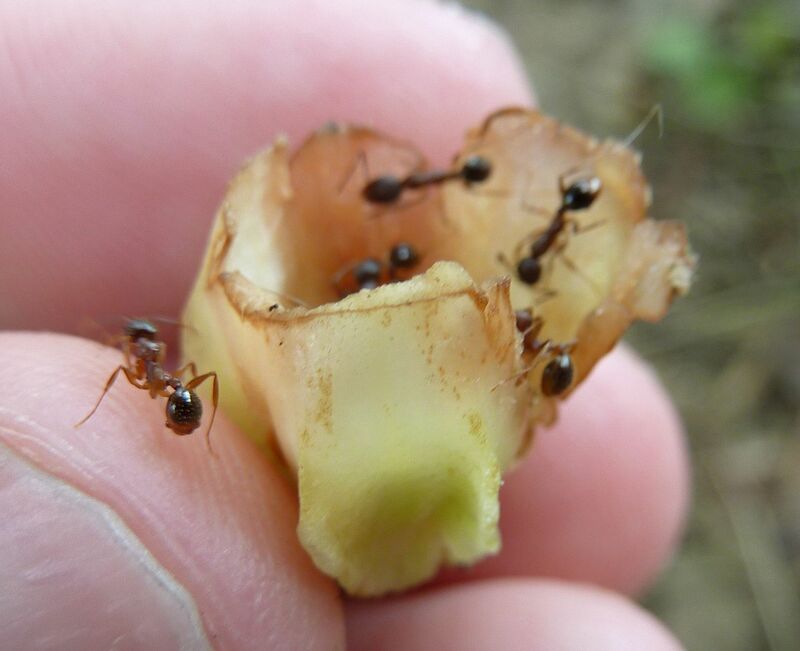 I've found common forest species such as Aphaenogaster (pictured above), Myrmica, Formcia, and Camponotus all carry the seed home. Though in the case of Camponotus there's the rick of ending up inside a tree or way to deep under the soil among tree roots. What's neat is studies have show colonies that have elaiosome as a food source produce more new queens the fallowing year. Specifically this applies to Aphaenogaster and Myrmica. 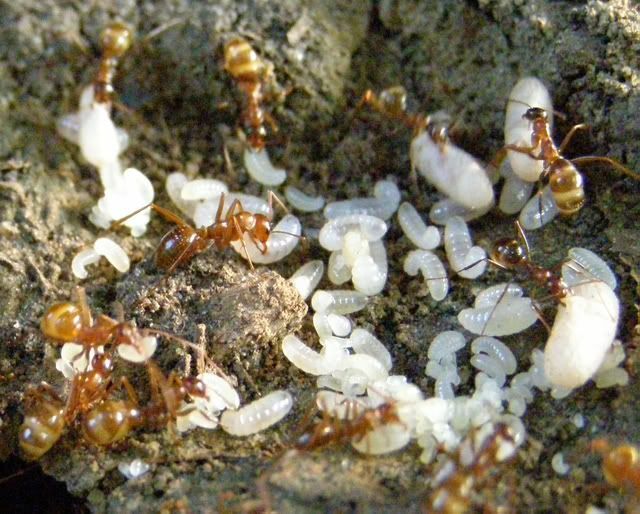 Though another study found in some species of Myrmica they produced more workers. It's unclear why and which is more beneficial. The bottom line though is these are a plants that make Ant Food. As an experiment I'm feeding all my captive colonies the stuff to see if it has any effect. Pictured above is Camponotus castaneus. 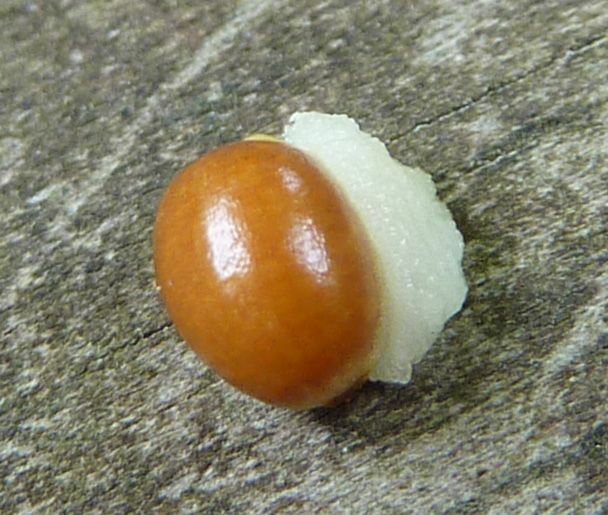 Two things I've noticed: The first is that elaiosome is tough, fleshy, and very much attached to the seed. 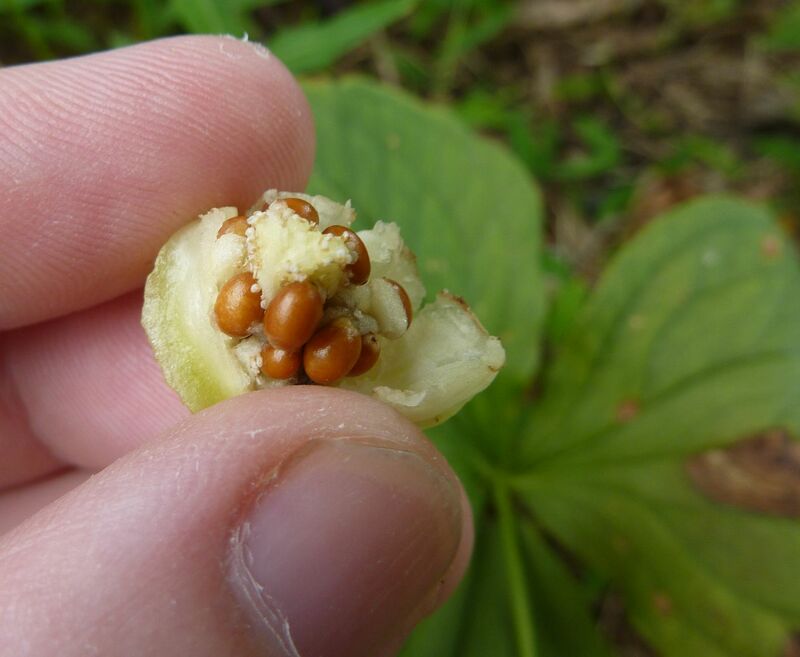 The second is Trillium seeds are hard like uncooked popcorn. It's likely they take two years to germinate to decrease the possibility of being eaten. 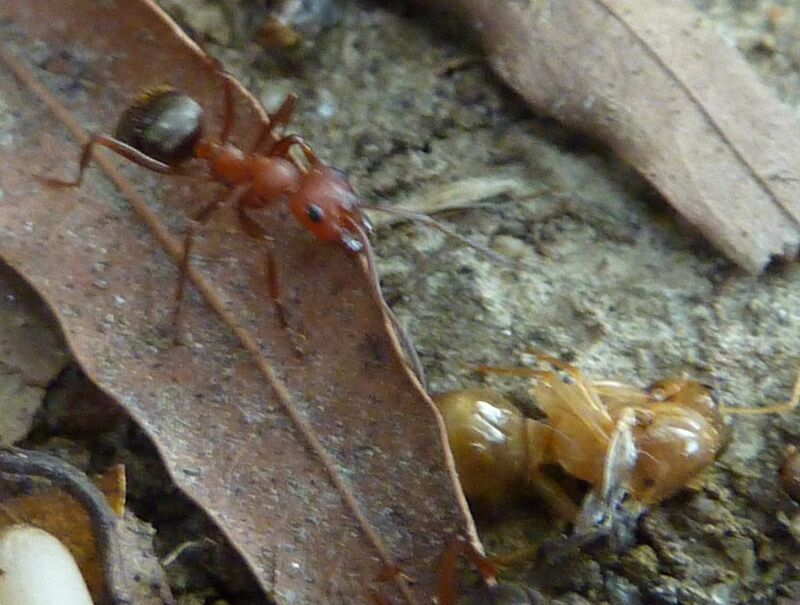 Aphaenogaster and Myrmica are both in the subfamily that specializes in starches, a.k.a. seeds. It's likely they become lost in the nest during the 2 years before they germinate, often the colony will have moved on entirely. 76 jars of honey and several shifts of work later, I'm finally free to blog again. New posts are coming soon. Also I have no idea why there's an ad to some Asian website on here. No idea what's it's advertising either. hmmm. 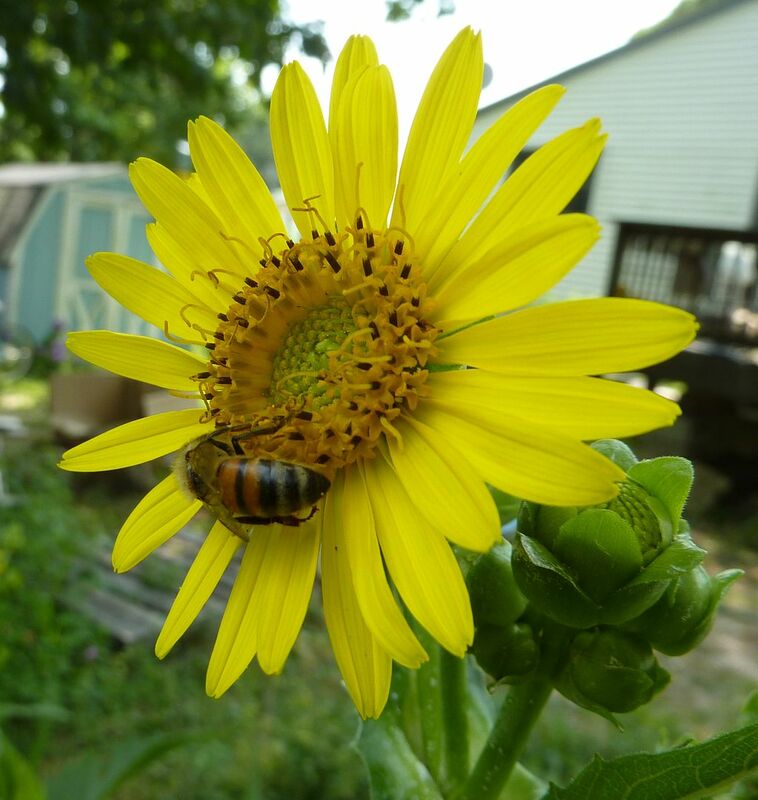 Tomorrow I plan on harvesting honey from my honey bees. This is typically a full day job and I plan on making a video out of it too so blogging might be scarce for a few days. 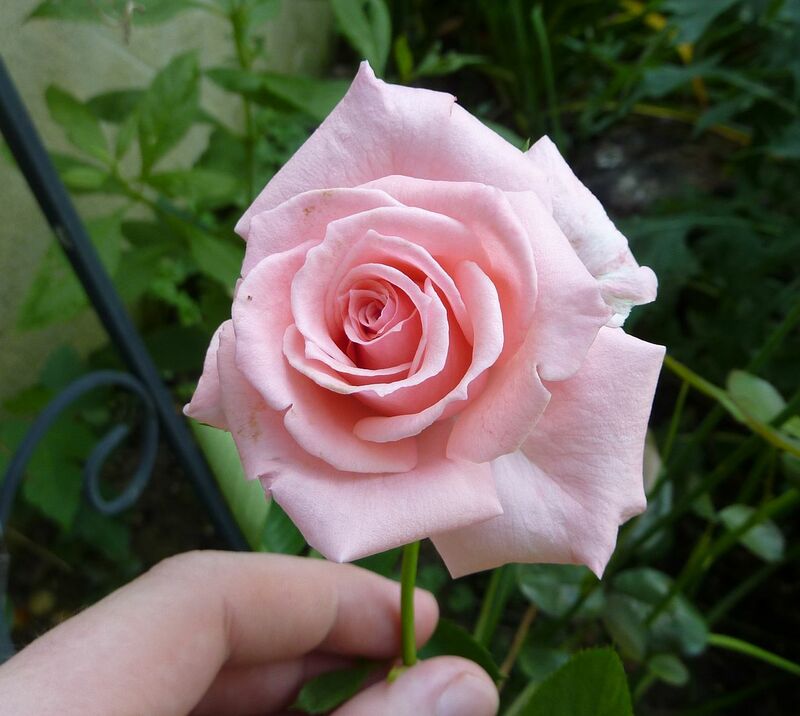 In the mean here's a picture of a rose. 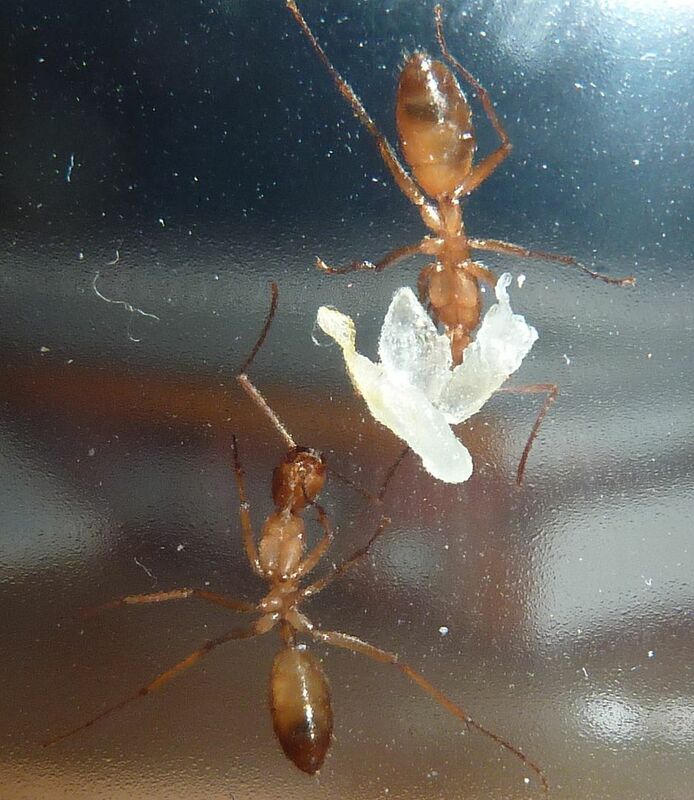 So I'm involved with the Raise a Tetramorium Colony Contest. 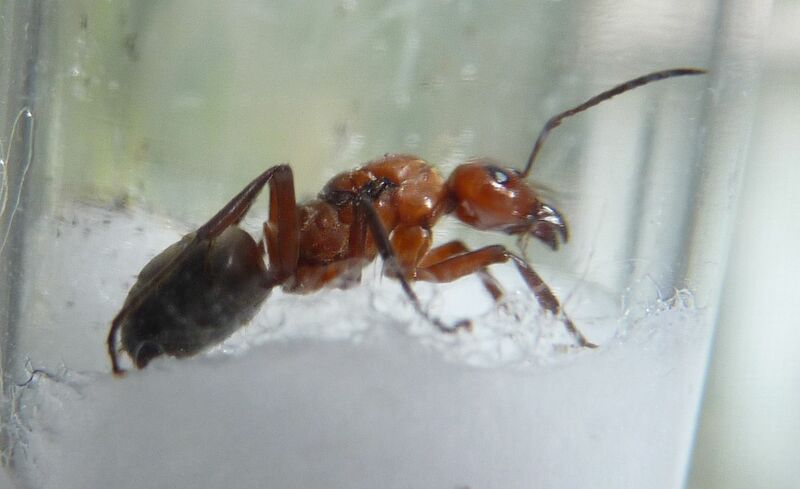 Here is a picture of my current prized queen. 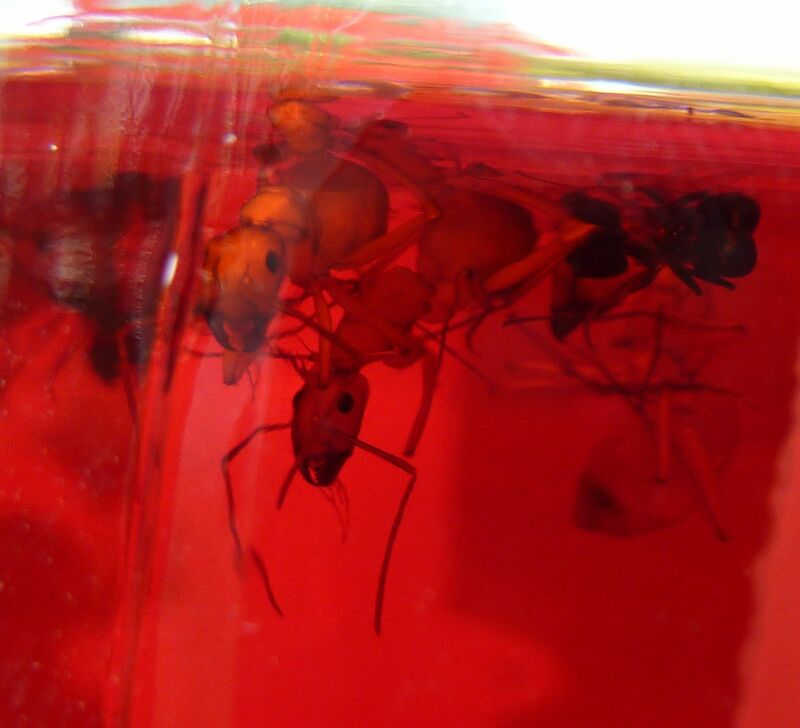 Common Pavement Ants are an invasive species in the US and they tend to do well in captivity. Actually they're multiple species but 2 or 3 are so abundant the world over that it was an ideal genus for such a contest. This picture was taken just hours after the one above. (they were also moved onto a red index card) Note how the pupa in the first picture is already a walking enclosed worker. And hours after that there are now 4 workers with more on the way. 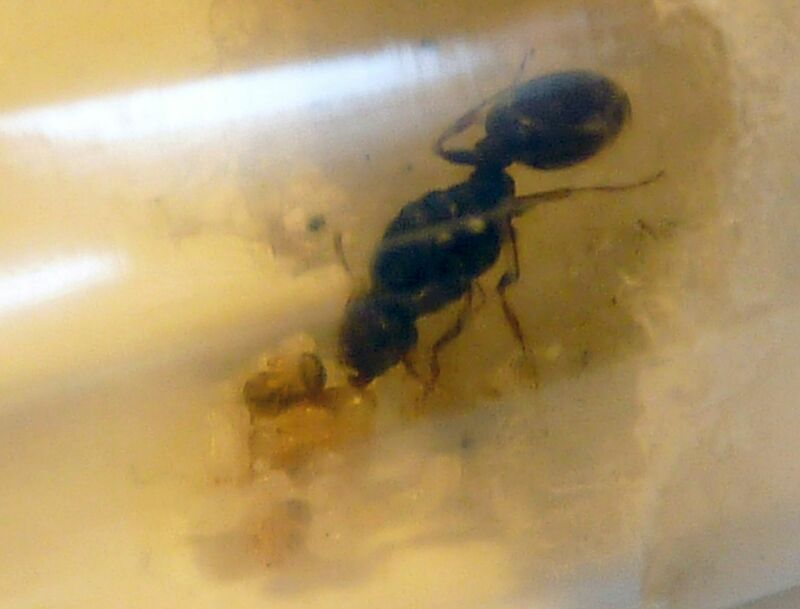 This queen was caught only 4 weeks prior to her first workers. I've seen queens produce colonies of 50 workers without any added food. That's impressive! Because I'm in it to win it though I'll be feeding my colony here excessively. My secrete weapon (hopefully,) will be Trillium Seed Elaiosome. No swarm of insects to be seen here but some can be just as good. Each morning I walk out the front door and am usually greeted by the fragrance of this plant. I have two planted out front and can't wait for them to reach their 8' tall goodness. Unfortunately this past winter's snow fall has bent most of the branches downward. Hopefully this winter isn't as harsh. A few pollinators I've seen on the plant not featured on the video are assorted sweat bees, scoliid wasps, and some type of blue mosquito that's slightly larger than the blood sucking one. Clethra alnifolia (Summer Sweet) is a plant very dear to me. I first saw it growing some years ago in a friend's garden. He's since moved away and the new owners have cut the thing down. I'm glad to say I saw it blooming in it's glory. My friend was on vacation and I was looking after his garden. I didn't know what the plant was at the time. 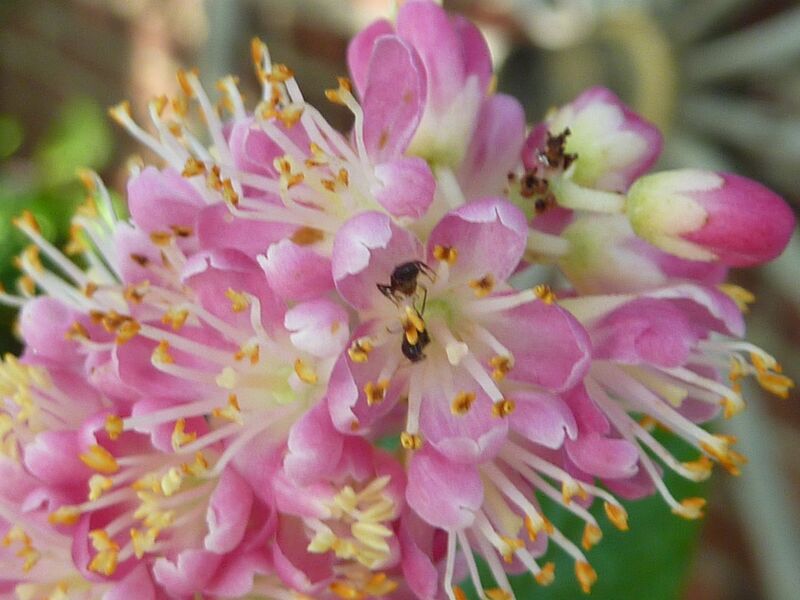 I entered the garden immediately smelling something incredibly sweet. It was a wonderful smell and I looked around at what on earth it could be. I finally homed in on in more than 30' away from the garden gate as the strange shrub by his garage. By then my jaw had dropped at the extreme array of pollinators working the shrub. Many of these insects I'd never seen before and several to this day I've never seen since. 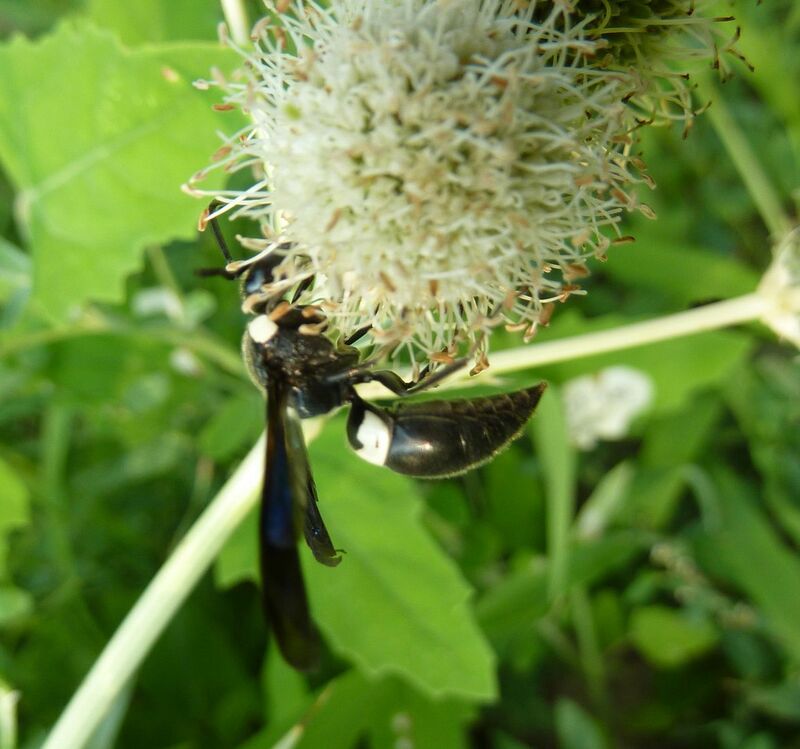 Enormous black wasps that are bulky like a Cicada Killer, on par with that of a Hummingbird flew over the thing. They were not Hummingbird moths... those I could recognize on the plant. A huge array of Scoliid Wasps flocked around the plant among tiny metallic green and gold sweat bees. To my surprise Honey Bees and Bumblebees weren't that common at all. To this day I've never seen such a diversity on any other plant. 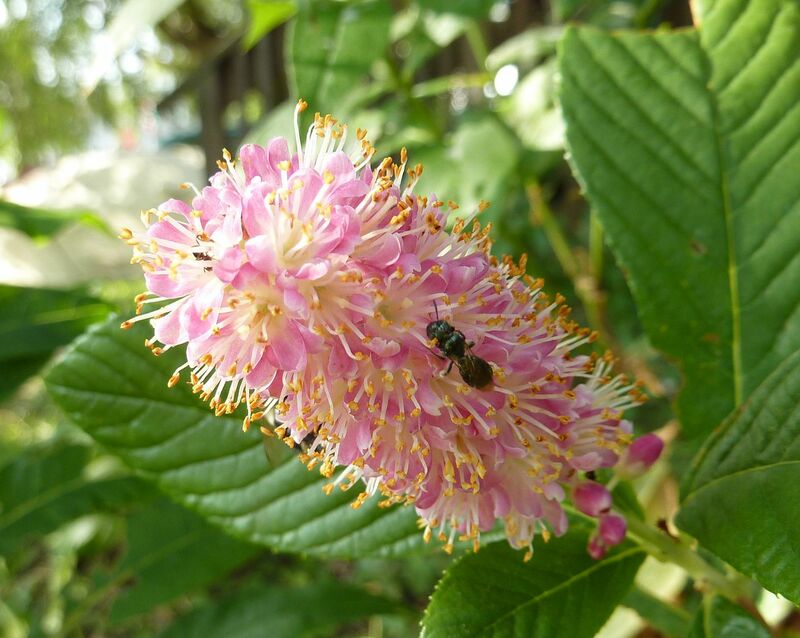 I've since planted 6 Clethra alnifolia's (Summer Sweet) and not once seen the cloud of insects I saw that day. Pictured is a red/pink flowering cultivar called "Ruby Spice." 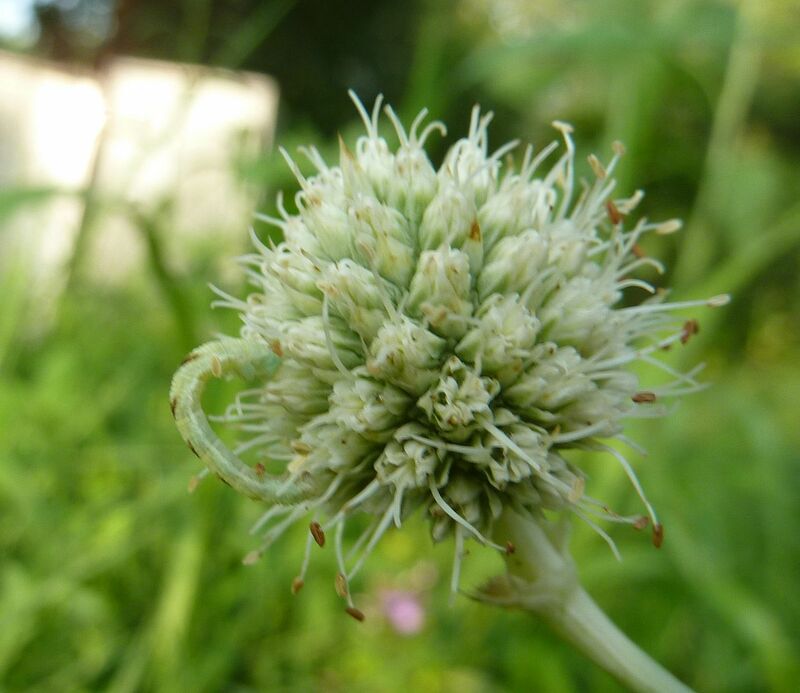 The true species has all white flowers. Only 3 of the plants are a size just shy of what my friend had in his yard. But planted in mass should have the same effect right? It's hard to believe red flowers would dull it that much. Well at any rate, I probably caught a plant in it's most ideal conditions at the peak of blooming. At least the ants seem to like it too. This little inch worm is either very smart or very stupid. 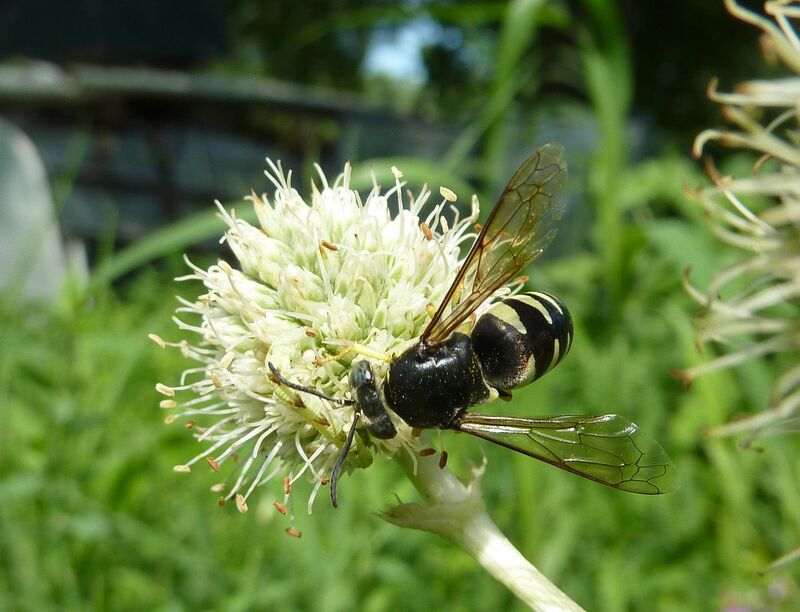 On the blooms to Rattlesnake Master is about the last place I'd expect to find a caterpillar. I've seen nothing but assorted wasps pollinating that plant. At least two are species of Scoliid wasp. 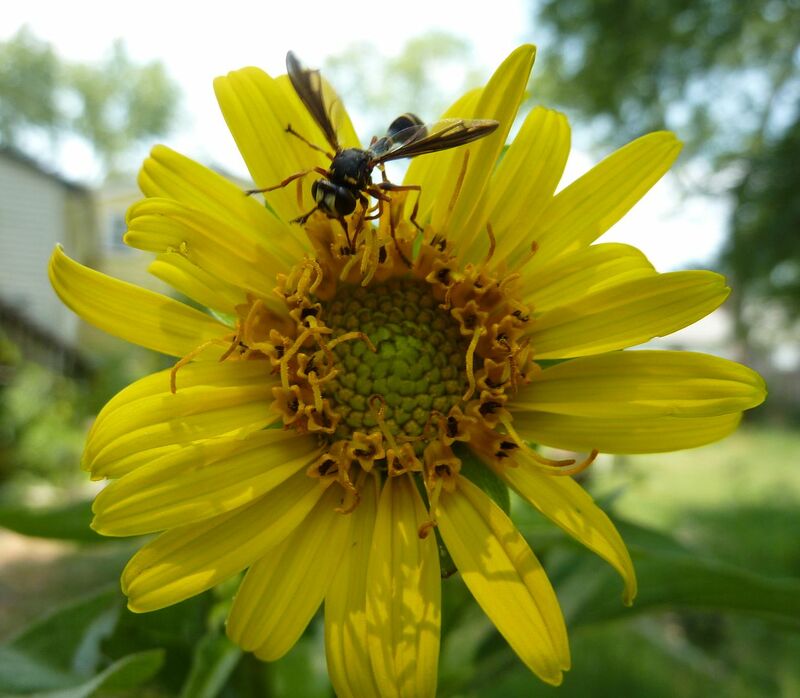 This plant is beneficial in how many specialized predatory wasps it attracts alone. Here's part 3 of the videos I've been doing. Wasps are very easily spooked. So often I'll go out to film the wasps only have have half of them fly off the plant. This time though they were all fairly well behaved. Well we bought a hummingbird feeder and it says to change the mysterious red liquid every 5 days. I leave that for my mom to do, and prefer feeding hummingbirds the natural way. Buying it was her idea. We've had them in the past, nothing ever shows up to them so we stopped for a while. But now that we've seen a hummingbird at the native honeysuckle, Lonicera sempervirens, that's changed. Oh My God! It's full of dead ants! AHHHHH! Yes it seems the nocturnal foraging Camponotus castaneus, one of the largest ants of North America, can somehow fit through the guard that normally keeps bees out of the thing. Another Camponotus species can also fit through but it's one of the smaller species you'd expect to find floating around in this thing among dozens of others. C. castaneus major workers are around 15mm long which is pretty darn close to an inch. So we've moved the feeder to another spot in the yard. I'd rather not slowly kill this beautiful species. Dead ants aside, this creates sometime beautiful in itself. It's on par with looking at specimens preserved in a vile of alcohol I think. The abdomen swells up to the point that the digestive track can becomes visible. The color becomes somber, (alcohol is usually yellow/amber in color,) which can force people to see details they would have otherwise ignored thanks to the color. Color is of course useful but patterns vary in ants and while I'd never say ignore it, color has to be backed up by other details. As interesting as this was, I hope I don't keep finding ants in this thing. Announcement: Feel free to comment now, you should be able to do so. 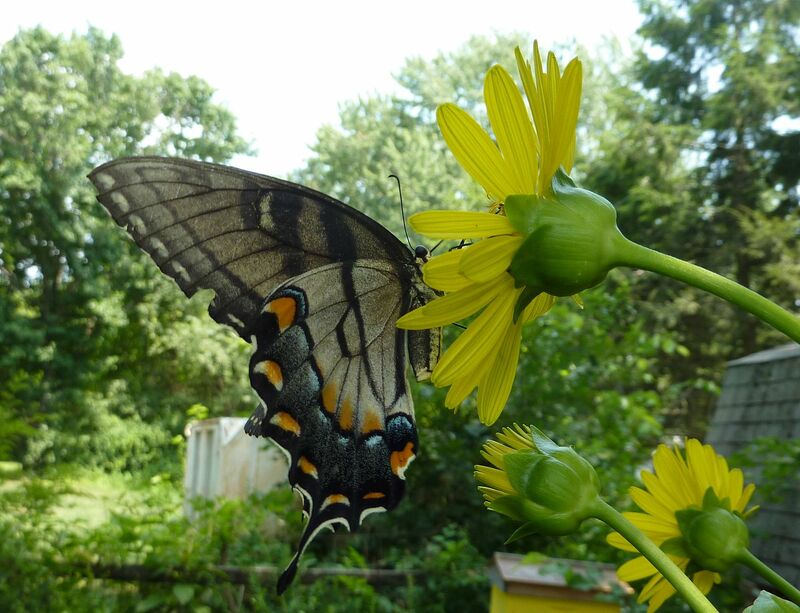 Well the Cup Plants are blooming, Silphium perfoliatum. In many ways it's similar to a perennial sunflower. Grows tall, flowers look about the same, has a habit of falling over sometimes, forms a nice sized, down right invasive clump, and I'm probably going to remove it from my yard before it escapes. 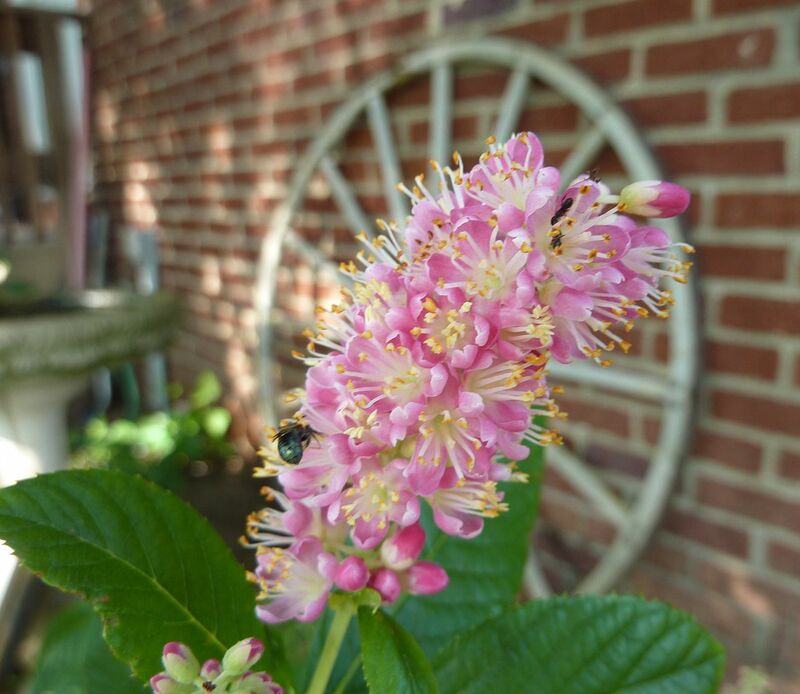 Though this plant is native to the US, saying it's native to the Midwest prairies and water ways is more accurate. As the trend of planing natives in the garden grows I foresee this plant becoming a real problem this side of the Appalachian Mountains. It's already spreading like an invasive in New York water ways. And I've even found huge clumps of it at the community garden water way I visit. 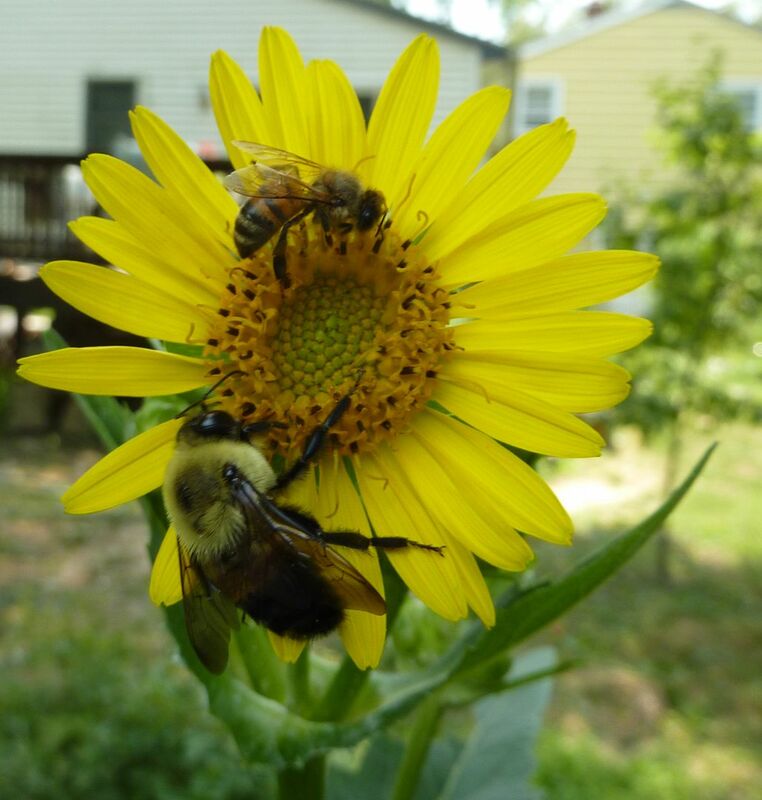 Part of it's success is the wonderful sunflower-like blooms that bees seem to fight over. This dies down after a few days and it's become just another perennial in my garden to them. A few of the odder, somewhat less seen pollinators go to them as well. I can never remember the name to this thing but it's a fly that mimics a wasp for some reason. 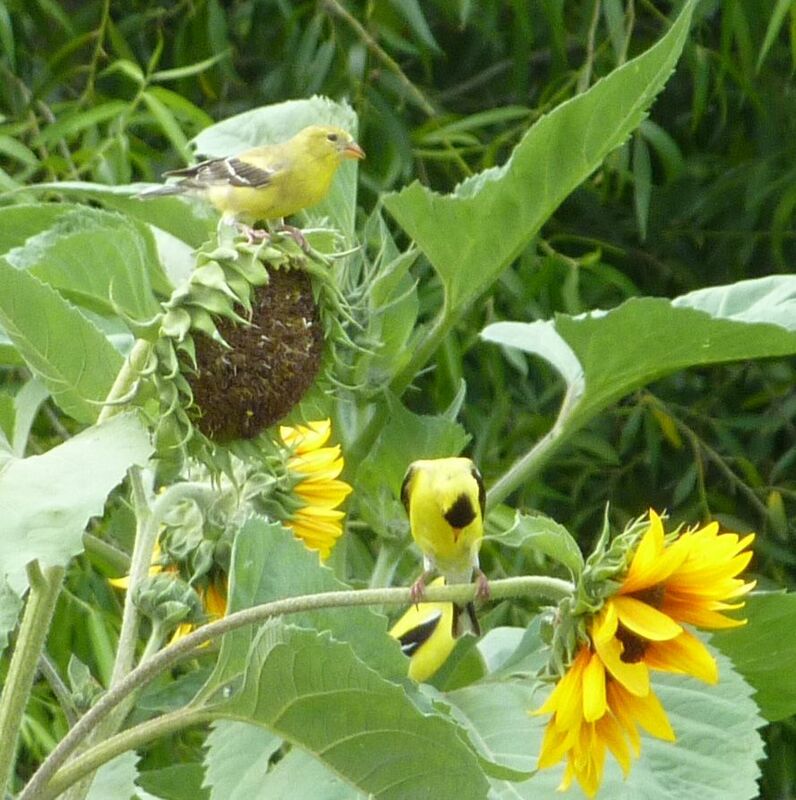 Supposedly the seeds are loved by Goldfinches. But then of course so are sunflowers, which have the benefit of being annuals and fairly easy to control. I couldn't get a patch of these started this year with the extreme heat the month of May brought. So hopefully the Cup Plant is as loved as it's said to be by these birds. Bottom line, the second the Cup Plant goes invasive in my garden it's gone! 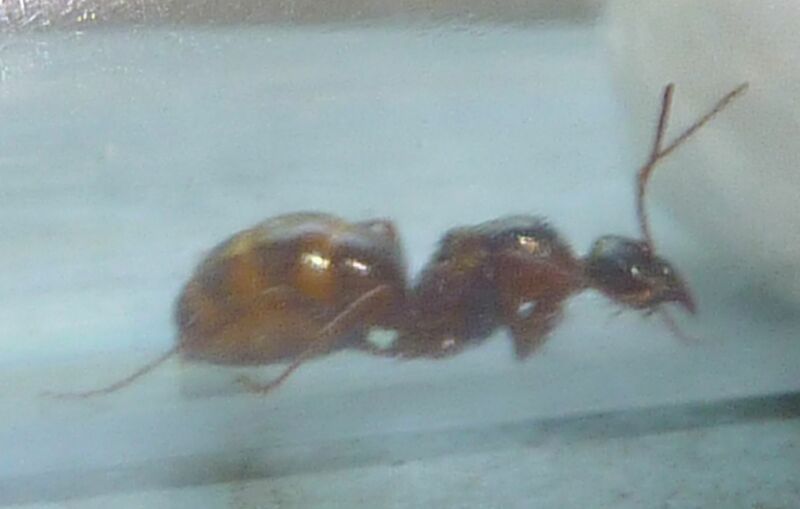 Formica pallidefulva queens are perfectly able to start colonies on their own. It's one of many Formica species flying now in the early morning to afternoon hours. This is a highly successful genus in temperate areas of the world. 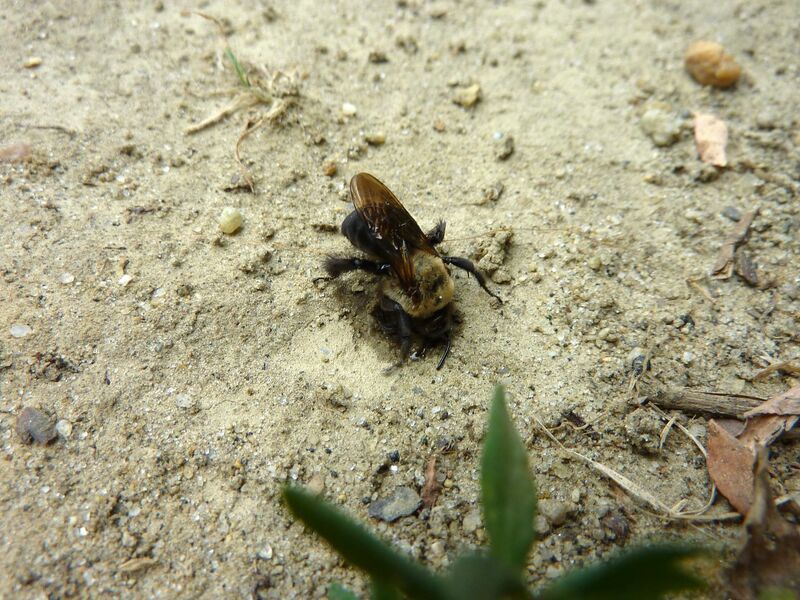 But something similar to what's happened in Bumblebees has also occurred in this genus. With colonies releasing thousands of queens, the room for new nests is very limited. While some species have taken to banding together there is another, more sinister option. Years of killing other queens for nest sites has eventually turned into killing queens with existing colonies and thus the social parasite was born. 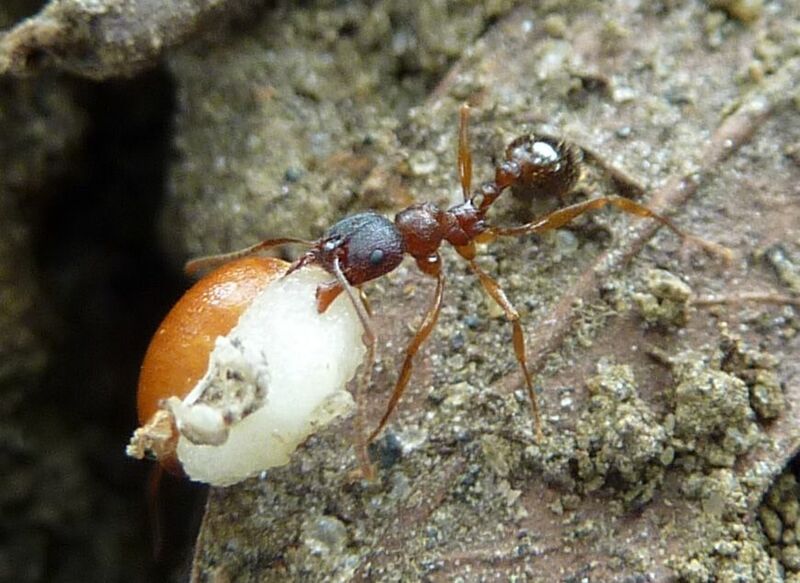 Social parasitic species don't need to leave the nest with as much food so the abdomen tends to be much smaller than the non-parasitic counterpart. They need to be aggressive too, to disembowel or decapitate their competition. So the head is larger and houses much stronger muscles to get the job done. 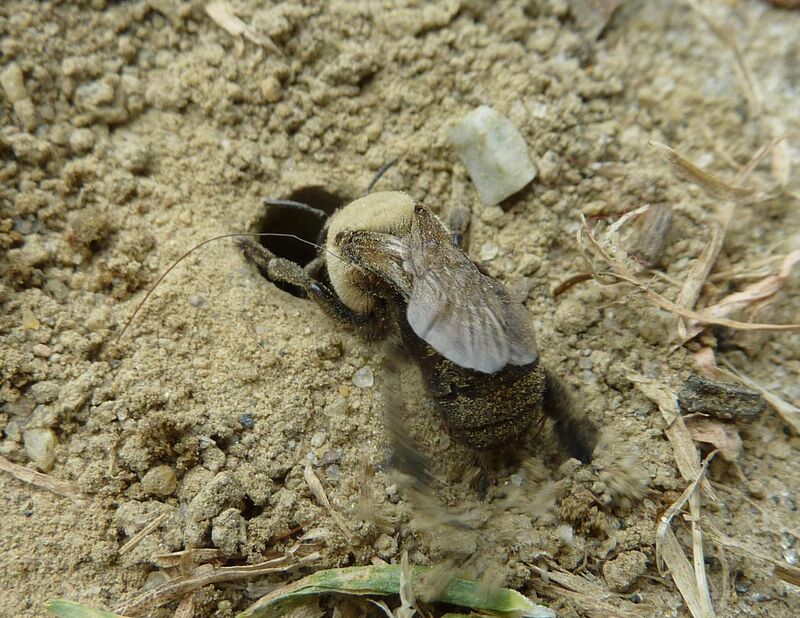 Disemboweling doubles as the odors of the host queen splash onto the social parasite giving her the colony odor. This fools the host workers into raising brood to the parasitic species. 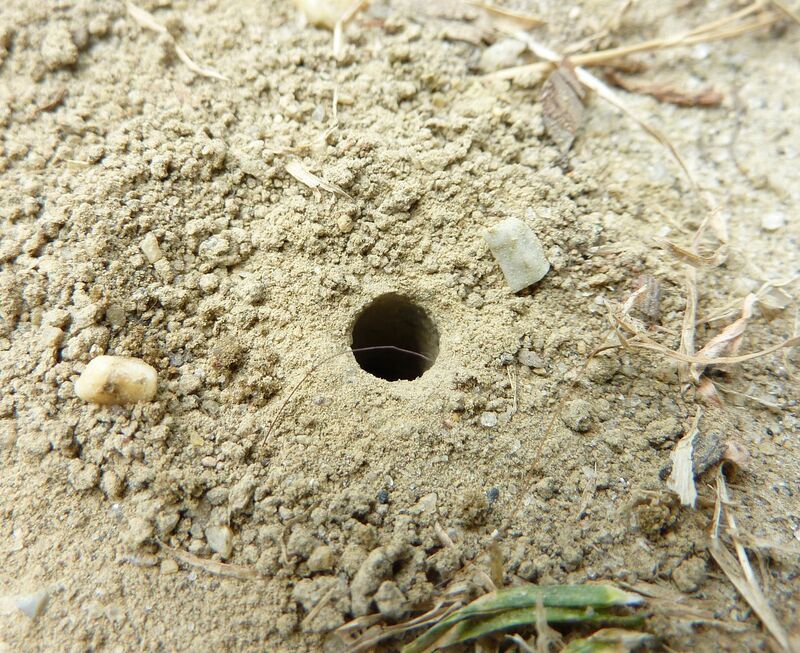 Some parasites stop here as we see in the genus Lasius. But some Formica take it to a whole new level. Formica pergandei (most likely identification) is one such species that's recently moved into my yard. 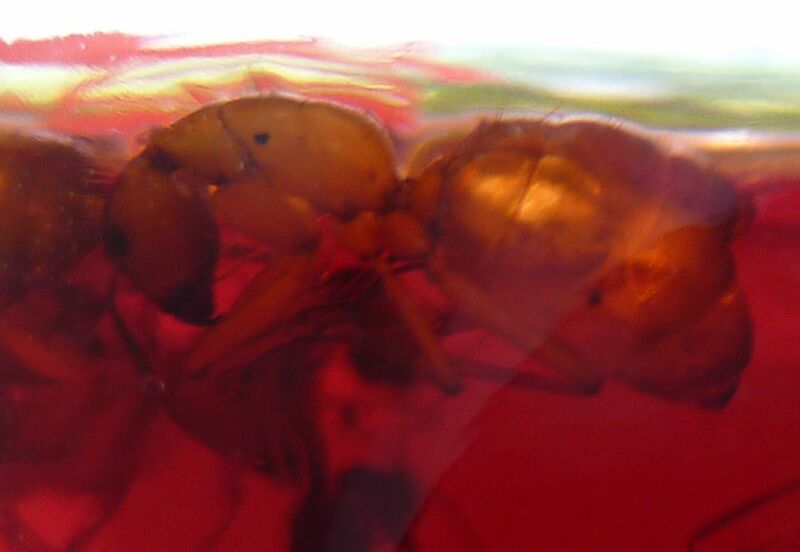 This picture of Formica pallidefulva was taken back in 2008. They've lived in my yard for a number of years and the colony is frankly a little boring. There are numerous colonies just like it in the area, and this one was doing great up until sometime in the past 5 days. A colony of Formica pergandei have moved in, though I'm not sure yet if they've moved on yet. 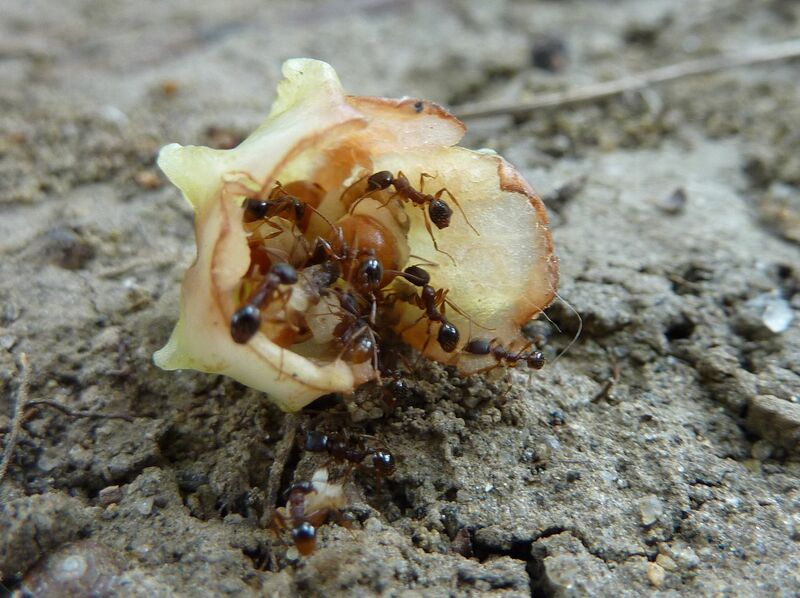 These ants are completely devoted to their host species, of which there are numerous. 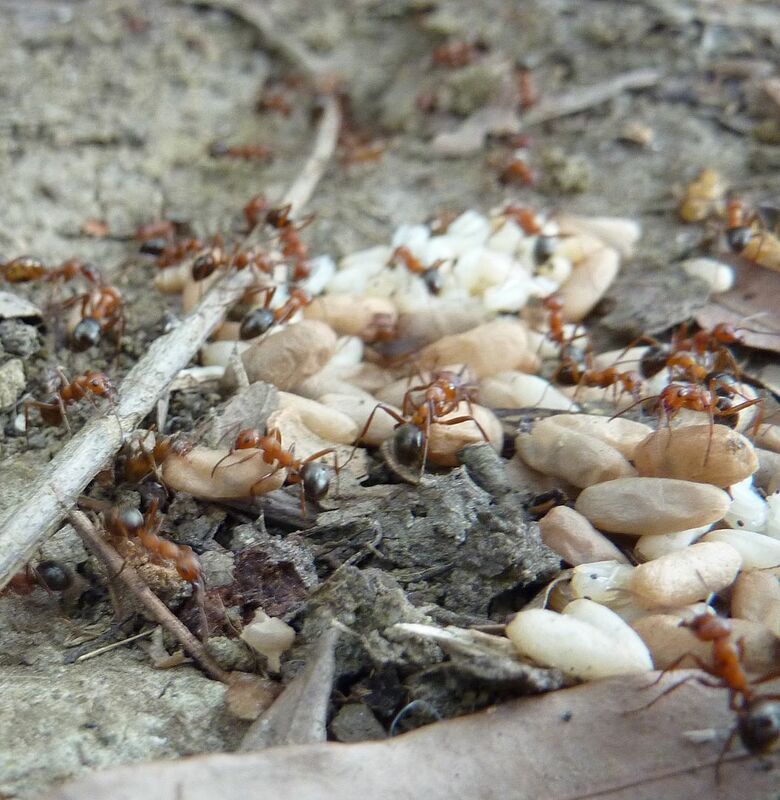 It's not enough for a queen to take over one colony of host ants. As their workforce dies they have to be replenished and other colonies have to be raided. Here is a quote from their description on Ant Web. Throughout the eastern and Midwestern US, F. pergandei is the premier dulotic Formica in grasslands and open woodland habitats, utilizing virtually all other Formica species (except other F. sanguinea group species) as hosts. 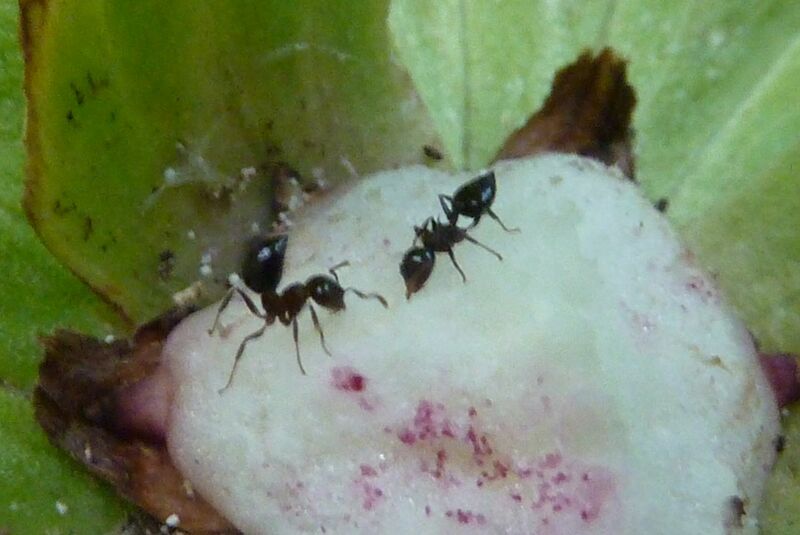 The host workers are obtained through regular nest-to-nest raids to steal brood of the host. 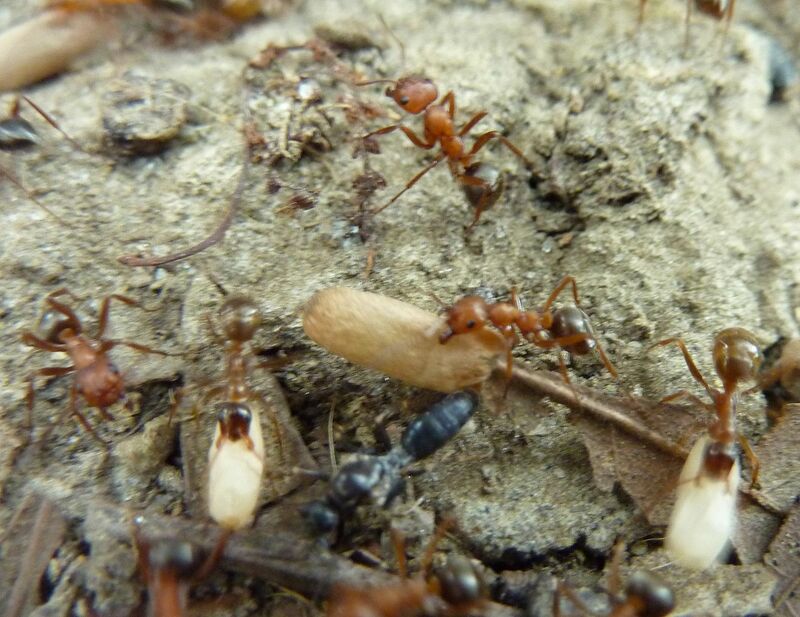 Often, some stolen larvae are eaten, especially any pillaged sexual brood, but at least a portion of the pupae are reared by host workers in the F. pergandei nest. Raids start in the morning, slow down or cease in mid-day, then pick up again in the late afternoon. F. pallidefulva and F. subsericea are the prevalent host species in woodlands, and F. incerta or F. montana prevail as the host in drier and wetter grassland habitats, respectively. Any one, or often, a combination of these species may occur among the host workers, with lesser numbers of other species from the pallidefulva, fusca or even the rufa-microgyna groups also in the mixed population. In Lincoln Co., one F. pergandei nest contained a mélange of six host species, including (in order of decreasing relative abundance) F. pallidefulva, F. subsericea, F. biophilica, F. dolosa, F. incerta, F. obscuriventris, certainly the most species-rich, naturally occurring ant colony on record! Nest architecture, and more interestingly, total mixed colony population level, seem to closely approximate those of the host, such that F. pergandei parasitizing F. montana or F. subsericea typically lives in a mound with the typical mound structure and a population like those of these host species, while those parasitizing F. pallidefulva often live in a moundless soil nest or in rotten wood with the much lesser total numbers of workers, as does this latter host. 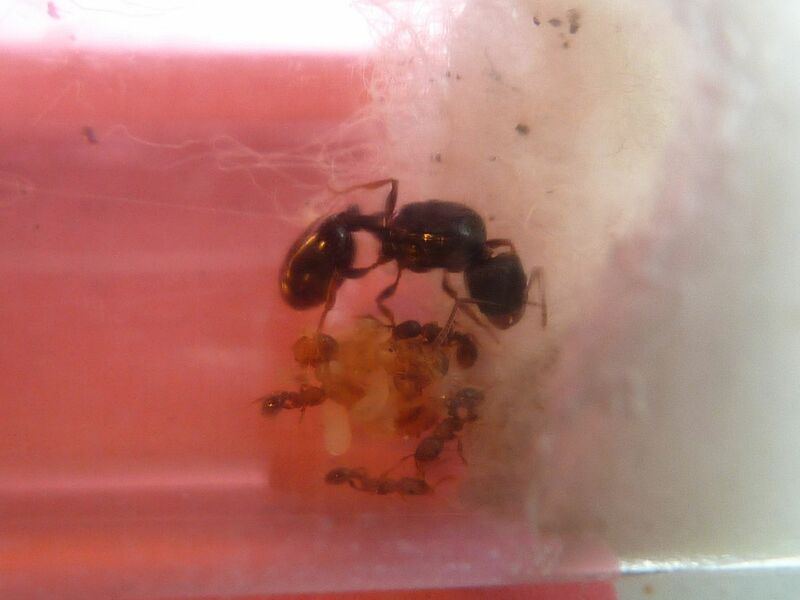 F. pergandei workers in the mixed nest do not care for brood, gather sweets, or effectively contribute to nest maintenance. While observing them I got the impression that they'd moved into this nest. I would imagen a raid would have scattered somewhat when I disturbed them. Most of these were stationary and assisting with pulling the brood into the former F. pallidefulva nest. They don't always move into their target's nest. Often this kind of Formica will do a quick raid and rob the colony of it's brood, sometimes the host colony will even survive the attack. Reproductive brood lay in ruins in the nest. The wings were mangled and parts of the developing ant were damaged. 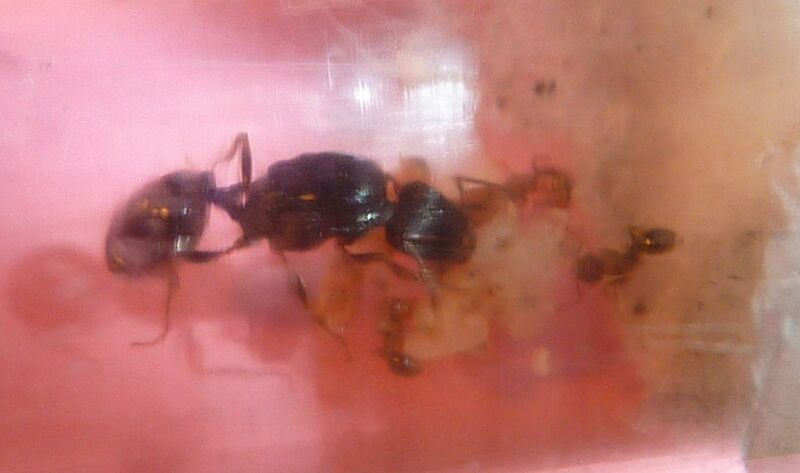 A male F. pallidefulva (the black ant bottom center) has had his wings removed. What they lack in basic essentials they more than make up for in aggression. They were even defending the nest. When disturbed several ants form a defensive stance. They have better eye sight and lock on to motion, only moving towards things that move. I had a fun time playing Red Light Green Light with this species. (Don't do that with Formica that spray acid as there's a serious risk you can go blind.) This type of behavior is an evolved defense against larger predators such as bears and opossums etc... that occasionally like eating ant brood. Overall this seems like a fun addition to the normal array of ants found in my yard. I've lived here for 26 years and never come across this species. I can't help but feel it's to do with my fairly recent hobby of gardening with native plants. What's most exciting though is I only ever see this type of ant in the forested areas at the nature preserve I visit now and then. 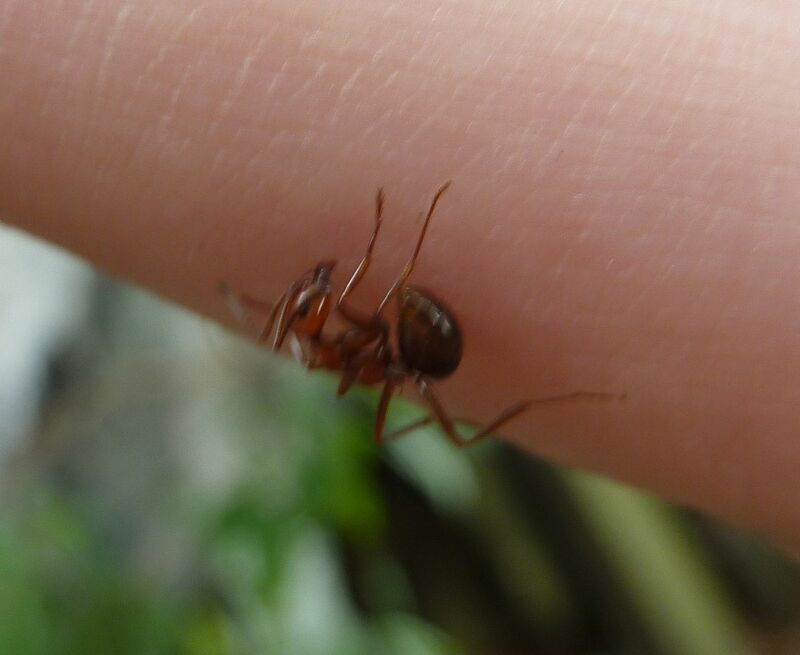 Hopefully I'll be able to post more on this species as they slowly devastate the colonies of Formica around the yard. Trillium luteum which I only have one of apparently didn't produce any seeds unfortunately. Trillium cuneatum flowered a bit and has a seed pod. 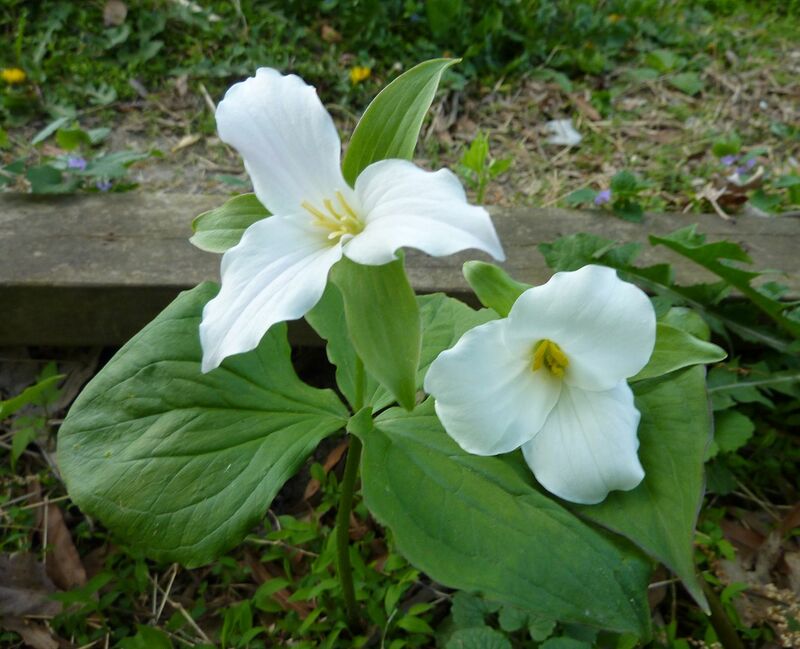 Trillium grandiflorum (my favorite) had loads of plants come up and flower. This produced the most seeds so far. After flowering in the spring Trilliums produce a berry. To the left is T. grnadiflorum which varies in size, this is the largest mine created. To the right is T. cuneatum. Inside the berry it's pretty much hallow besides a few seeds and fleshy material holding them in place. Each seed has a package of eliasome on it. That's the white stuff, and ants find it irresistible. They hallowed it out pretty fast. 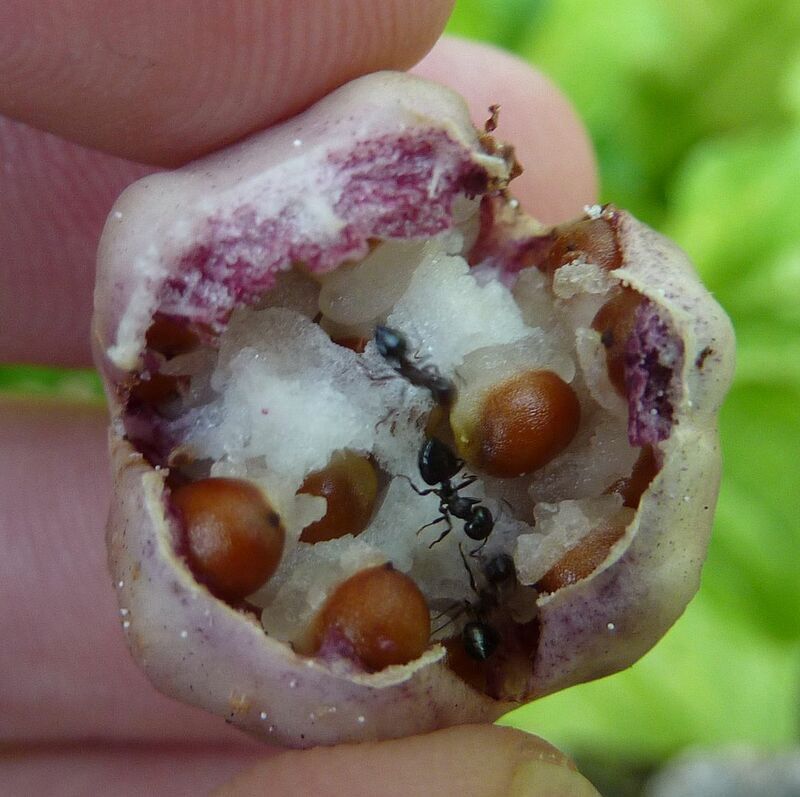 I tried a few seeds with a Crematogaster colony and they didn't know what to do with them. Some nibbled at the food part while others tried stinging the seed. 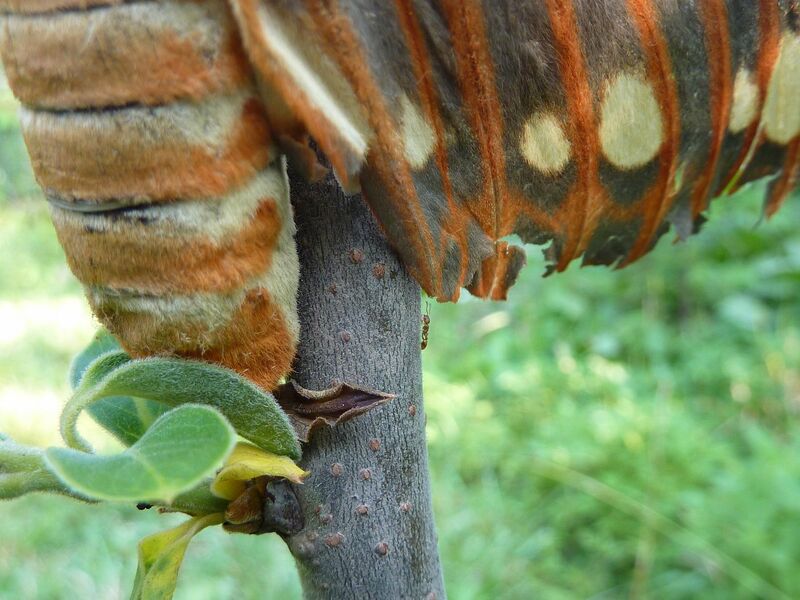 Meet Citheronia regalis, aka The Regal Moth, aka The Hickory Horned Devil who's caterpillar stage can reach close to 5 inches long. 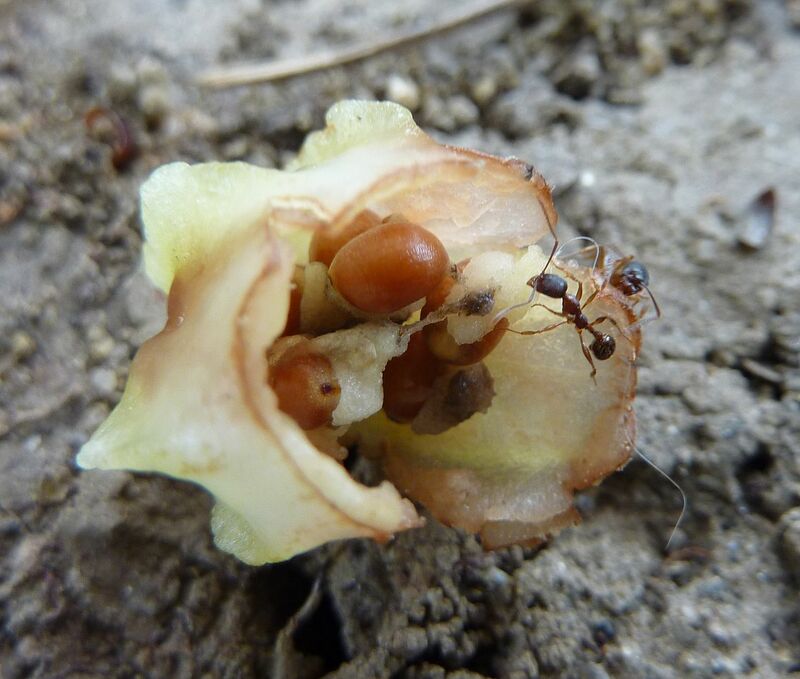 Note the tiny Acorn Ant, Temnothorax sp., in the picture... if you can find it. There she is! 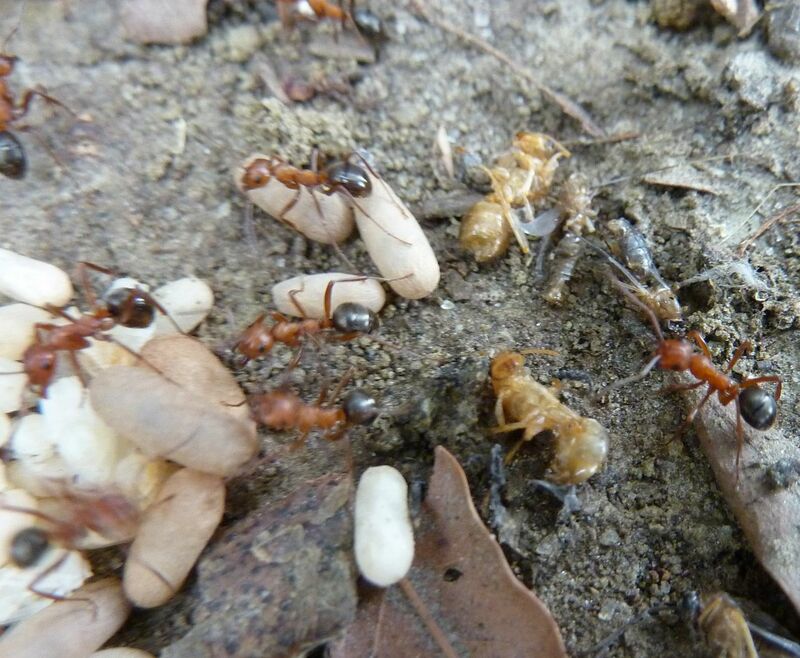 A colony of these ants could sooner live inside it than even dream of dragging it home. For a better comparison here is my hand. The wingspan measured 6 inches from tip to tip. The above photos were staged. 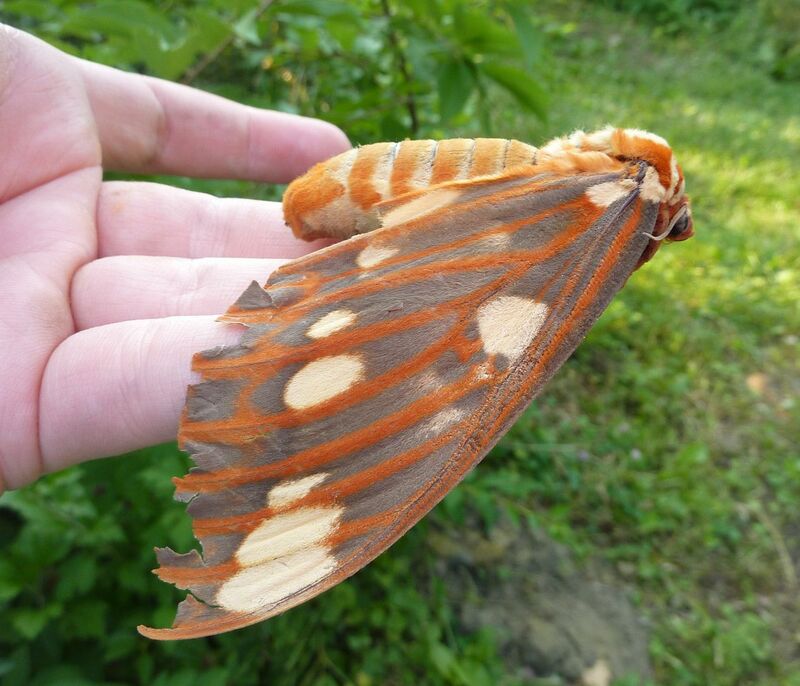 My brother who works down at the shore found this moth in a state near death and brought it home. In a vane attempt to get it (him? her?) 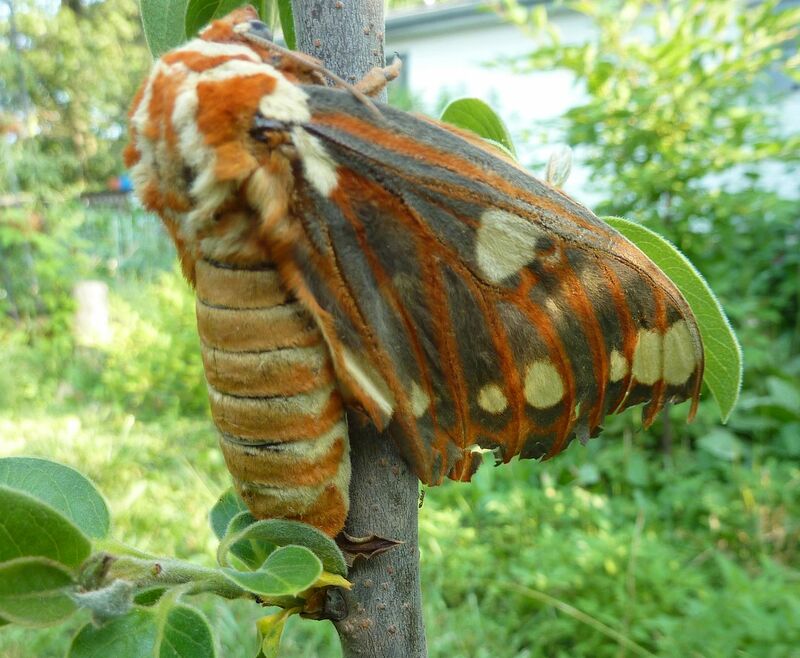 to lay eggs I placed it on the Persimmon tree. (I've found Persimmons take forever to leaf out in the spring time.) Mothra died shortly before posting this... I think. It's actually yard to tell as it's in an almost catatonic state only moving the head muscles.